Our "new" neighborhood restaurant, Allium. The menu is lovely; the staff is great; the location could not be better (walking distance! ); and "Neighborhood Dinner" is something to look forward to each month. D'lish! Movie Night in our 'hood. Step 1: Get the kids to bed. Step 2: Inflate the huge movie screen and wheel out the electronics. Steps 3-5: Get cozy, enjoy your cocktail(s), be entertained with your BFNs (best-friend-neighbors). Angry Birds. It's a game on my iPhone. Warning: it's super addictive! Getting more business through Etsy. The stationary-making keeps my creative juices flowing and I love it! 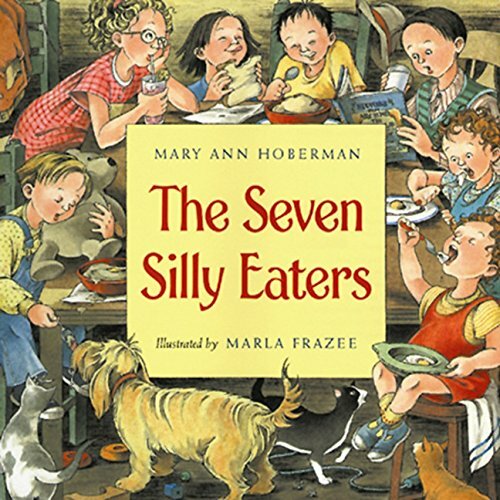 The children's book, The Seven Silly Eaters by Mary Ann Hoberman. You can even make Mrs. Peter's birthday cake by following the recipe here. If you have kids between the ages of 3 and 6, I think you NEED to own this book. It's delightful. two grilled pita breads (thin) chopped and mixed in. The school year beginning again. Geneva's in kindergarten (at Amiguitos) and Piper is in her second year of Spanish preschool at Amiguitos also. They both attend M-F from 8am-12pm. We have afternoons for gymnastics, ballet, playdates, the library, and bike-riding (while the weather holds out). The girls love their school, they love their teachers, they have great friends to spend the mornings with and I get them for lunch and the rest of the day. It's great. Golfing. Such an addictive activity. My husband. I know, duh. But really, I'm totally into him. So many things about this picture: a) the delight of being on this flying ride, b) my friends who went on it with me, c) the memories of the day at the fair it brings back, and d) looking forward to doing it (and other silly things) for as long as possible. Geneva's joy at learning to tie her own shoes. My garment steamer. What did I ever do before I owned this little slice of heaven?!? I got mine at Costco--shipping is included in that price and it's worth every penny! This picture of Gretchen and myself. I think it's hysterical. Little kids with English accents. Especially the phrase, "I can't imagine why she's so cross with me." Carpooling. It's so nice to not have to make the roundtrip to the girls' school twice-a-day--especially now that they're going five days-a-week! 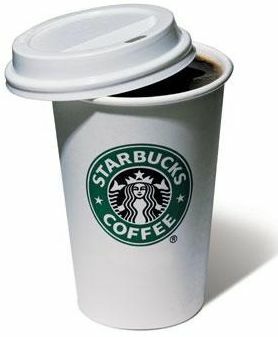 It adds 10 minutes to my morning and saves 40 minutes every afternoon. This picture of Sean and Michele, who are not a couple but do a great job of demonstrating what a fantastic time we're always having around the 'hood. The dry-erase board/weekly calendar I bought from Michael's for $2. It sits in the kitchen window sill and keeps me sane. These leggings from Target. I almost spent WAY TOO MUCH money for a nice, thick pair of slimming leggings from a store that has nothing to do with the study of humanity, when I came across these (nearly the exact same thing) for $25. Note: I do not condone the practice of tucking one's shirt into skin-tight leggings (as shown in the picture) no matter what size you are! Monograms--of all kinds. I picked this one up not too long ago from a Ellephanie on Etsy. Little Lion Man from Mumford & Sons. Give it a listen here. There are explicit lyrics--so be sure there are no little ears around! 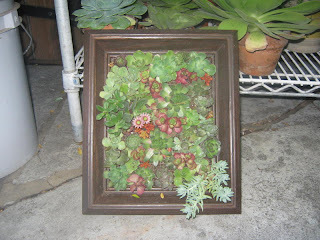 My mom's new projects. She calls them "Living Art." 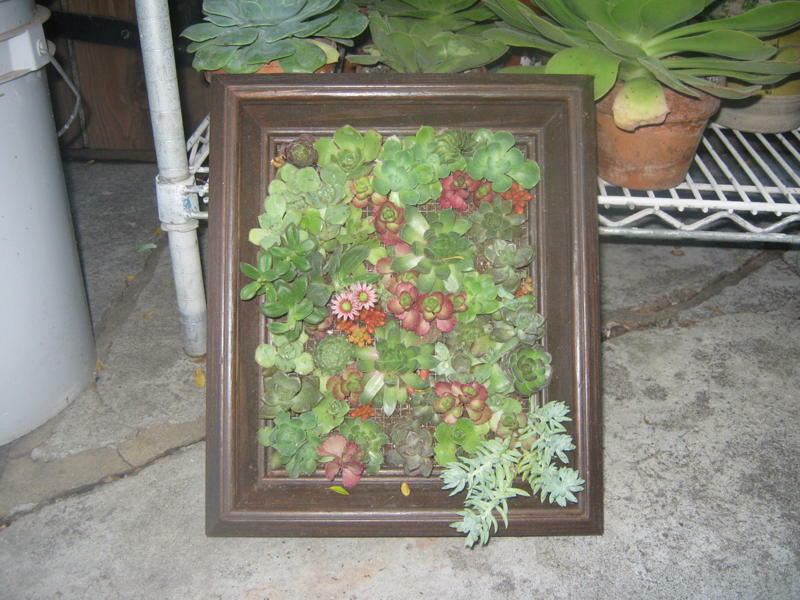 It's a picture frame with succulents growing out of it. Very cool. The smell of a burnt match. My new pillow (thanks McGoughs). oh my garsh I love the girls in their first day of school pic. Especially Pipes and her ultra pointed toe!! And the chicken and salsa? That dish is a lifesaver in our home.